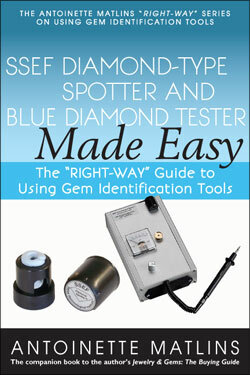 Explains in non-technical terms how to use the SSEF Diamond-Type Spotter and SSEF Blue Diamond Tester to identify diamonds, and how to separate natural diamonds from imitations, treated diamonds, synthetics and look-alikes. The approach is direct and practical, and its style is easy to understand. 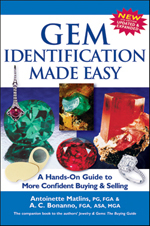 With this highly accessible guide booklet, anyone can begin to master gem identification using the SSEF Diamond-Type Spotter and SSEF Blue Diamond Tester. Antoinette Matlins, PG, FGA, is an internationally respected gem and jewelry expert, author and lecturer. Honored with the international Accredited Gemologists Association’s highest award for excellence in gemology, Ms. Matlins’s books are published in seven languages and are widely used throughout the world by consumers and professionals in the gem and jewelry field. Her books include Jewelry & Gems: The Buying Guide (over 400,000 copies now in print—the only book of its kind ever offered by Consumer Reports); The Pearl Book: The Definitive Buying Guide; Colored Gemstones: The Antoinette Matlins Buying Guide; Diamonds: The Antoinette Matlins Buying Guide; Engagement & Wedding Rings: The Definitive Buying Guide for People in Love; and Jewelry & Gems at Auction: The Definitive Guide to Buying & Selling at the Auction House & on Internet Auction Sites (all GemStone Press). Former gemology editor of National Jeweler magazine, her articles and comments on buying and selling gems and jewelry and on gem investment have appeared in many national and international consumer and trade publications. She is also the author of the “Gemstones” chapter in the Encyclopedia of Investments, 2nd Edition. Ms. Matlins has gained wide recognition as a dedicated consumer advocate. She has spearheaded the Accredited Gemologists Association’s nationwide campaign against gemstone investment telemarketing scams. A popular media guest, she has been seen on ABC, CBS, NBC and CNN educating consumers about gems and jewelry and exposing fraud. In addition to her educational work, Ms. Matlins is retained by clients worldwide to seek fine, rare or unusual gems and jewels for acquisition.